As the plum tomatoes ripen, I toss them into a gallon-size freezer bag and store them in the freezer. Once I have a couple of bags filled, they get defrosted and the skins just peel right off the tomatoes. It takes a good day to defrost a bag of tomatoes, and you have to deal with really cold fruit, but (to me) it beats standing over a pot of boiling water to blanch the skins off. This year I didn’t have time to can and process a whole bunch of jars. I wanted something that would use up all my tomatoes but wouldn’t be a lot of work. I started thinking along the lines of tomato chutney and somehow found my way to tomato jam. Once again, the recipe is from Tasty Kitchen. Because I really only changed the type of vinegar I used, it seems a little redundant to post the recipe in full here. So, I won’t. I don’t feel the change in vinegar made the tomato jam that different. The recipe on Tasty Kitchen doesn’t specifically say to leave the seeds and skin on the tomatoes, but from various internet poking, I decided to take off the skins (since it was easy to do on my defrosted tomatoes) and leave the seeds in. I left the pot at a simmer, with the lid off, stirring the mixture occasionally until I felt it was thick enough. I think I also gave it a quick whir with my immersion blender to smush up any big chunks of tomato and onion. Three pounds of tomatoes gave me four half-pint jars, which is not nearly enough to get you through to next summer. I haven’t tried using canned tomatoes yet, but I don’t see why it wouldn’t work in a pinch. A dollop of tomato jam on top of a Ritz cracker smeared with cream cheese is a happy bite. Much like the candied jalapenos, I think the tomato jam would be a good complement to chicken or pork, but it’s also nice in an egg taco or with a hot biscuit. And, if you mix a jar of candied jalapenos with a jar of tomato jam, you get a sweet, tangy sauce that is like bbq sauce, but without the smokiness. This entry was posted in food, recipes and tagged tomato jam, tomatoes. Bookmark the permalink. I adored your tomato jam on Saturday! Thanks so much for hosting all of us! 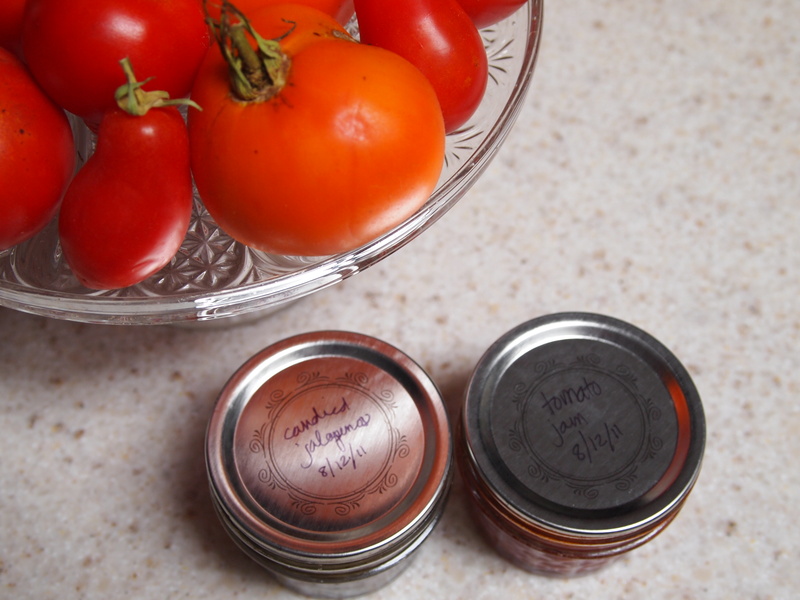 I was contemplating making a gift bag of tomato jam and jalapenos for the gift exchange, but I only had one jar left! Guess it’s time to make more.